The reaction between hydrogen and oxygen is one of the most powerful sources of rocket thrust there is, with the exception of some highly exotic combinations that include fluorine as an oxidiser. Engineers are always keen to use it where possible due to its high efficiency and relatively benign propellants and exhaust. 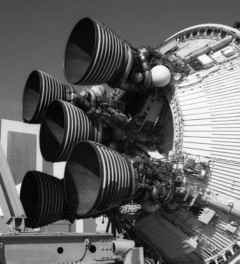 On the Saturn V, both the second and third stages used these two propel-lants through J-2 engines to get the Apollo spacecraft most of the way to Earth orbit and to boost it on towards the Moon. Five engines were mounted on the S-II and a single example on the S-IVB. Outwardly, the J-2 might seem like a smaller version of the F-l engine but beyond having a chamber and nozzle fabricated from fuel-warming pipes, there were few similarities between these motors. In particular, because the temperature of the liquid hydrogen fuel was barely above absolute zero, the J-2 had to cope with two cryogenic propellants. Prior to start-up, and to prevent the propellants turning to gas as soon as they entered the engine block, the J-2 had to be pre-chilled by feeding a small amount of propellant through its components. The five J-2 engines at the base of an S-II stage. mesh arrangement through which over 600 tubes-within-tubes passed. These carried LOX through their central passage and LH2 in the outer. Some fuel was diverted to cool the mesh. An important component of the engine was a valve that could reduce the flow of LOX to the injector. This operation altered the thrust a little but the point of having it was to allow the consumption of LOX and LH2 to be balanced over the length of the burn to ensure that the propellants were equally utilised. Another important component was the spherical start tank - which was actually a tank within a tank. 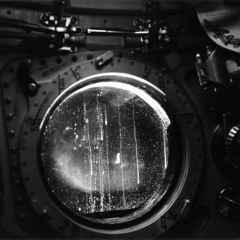 The inner tank held helium, whose pressure operated the engine's valves. The outer tank held LH2 to spin up the turbopumps prior to hot gas becoming available from a gas generator that would keep them running. In the restartable version of the J-2 for the third stage, this outer tank could be refilled in preparation for its second burn -the burn that would send the crews away from Earth to the Moon. The starting sequence for the J-2 engine was equally as complex as that for the F-1 and only a summary is within the scope of this book. The basic ignition source was the augmented spark igniter - NASA terminology for what was basically a spark plug which lit a flame source in the combustion chamber. 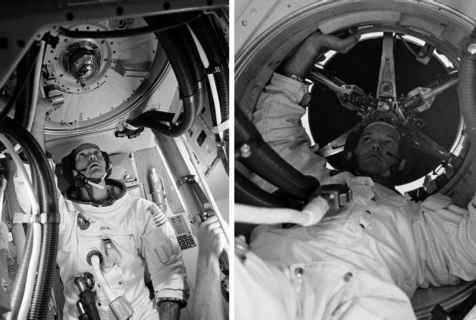 The main fuel valve was opened and LH2, pushed only by the fuel tank's pressure, began to flow around the pipes that formed the engine's walls, conditioning them to the fuel's extreme chill. After a short delay, the hydrogen in the start tank was discharged through the pump turbines to make them spin before the gas generator began burning LH2 and LOX to produce hot gas for the same task. 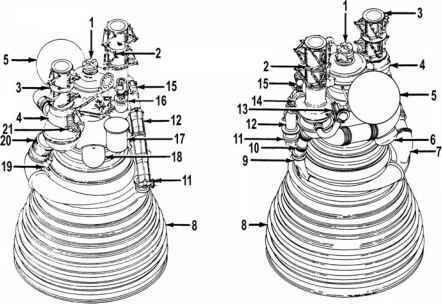 The LOX valve was then opened, allowing LOX to begin burning in the combustion chamber with the LH2 that had been circulating through the chamber walls. As the turbopumps spun up to full speed, this valve was slowly opened to bring the engine gently up to its rated thrust. Streaks run across the hatch window of the Apollo 12 spacecraft.